South African (with British citizenship) academic and composer, particularly of choral works. John Joubert (/dʒuːˈbɛər/ jew-bair) lived in Moseley, a suburb of Birmingham, England, for over 40 years. 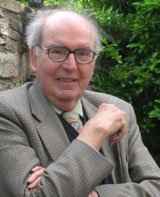 A music academic at the universities of Hull and Birmingham for 36 years, Joubert took early retirement in 1986 to concentrate on composing and has remained active into his 80s. Though perhaps best known for his choral music, particularly the carols Torches and There is No Rose of Such Virtue and the anthem O Lorde, the Maker of Al Thing, Joubert has composed over 160 works including two symphonies; violin, piano and bassoon concertos; and seven operas.